To celebrate the 50th anniversary of the original 1969 Woodstock Music & Arts Fair, Woodstock 50 will take over the fields of Watkins Glen, New York from 8/16-18. Artists like Dead & Co, the Killers, the Black Keys, Jay-Z, and Chance The Rapper were confirmed to play the festival earlier this month, following a brief delay and rumors that the event was in financial trouble. Now, we see the full lineup. Robert Plant, The Raconteurs, Sturgill Simpson, Halsey, and Imagine Dragons are some of the artists slated to headline Woodstock 50. Other acts include Vince Staples, Courtney Barnett, Earl Sweatshirt, Margo Price, Soccer Mommy, and Princess Nokia. The lineup includes artists who played at Woodstock in 1969: Dead and Company, John Fogerty, Santana, John Sebastian, Country Joe Mcdonald, and Canned Heat. The lineup, which boasts over 80 acts, was announced tonight at a launch party called “The Secret Session” at Electric Lady Studios in New York City. Common and Fogerty performed at the reception, following a panel discussion with Woodstock co-founder Michael Lang. In addition to performances, Woodstock 50 will feature film screenings, glamping tents with real beds, and resident jugglers and clowns. Some of the contemporary bands will also stage tributes to artists from the original Woodstock, like Janis Joplin, the Band, Jefferson Airplane, Joe Cocker, and more. And it wouldn’t be a 2019 festival without an accompanying livestream. 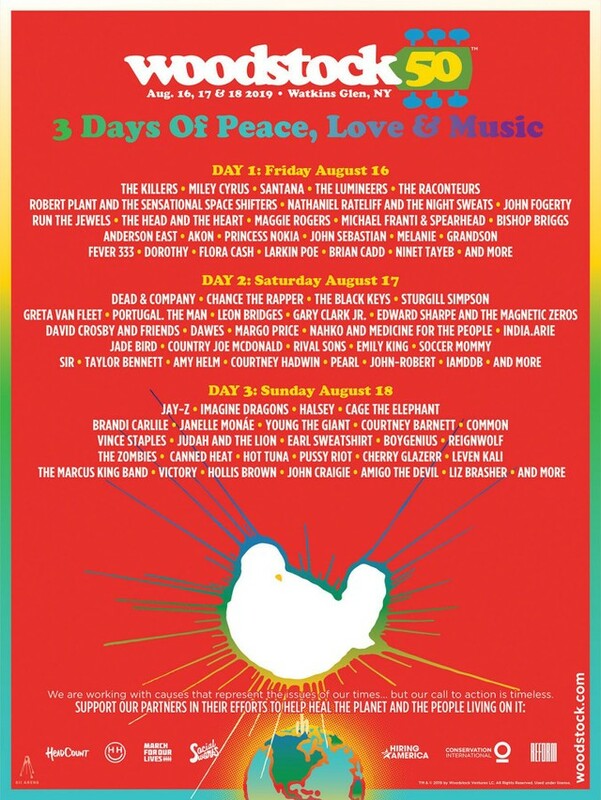 Check out Woodstock 50’s full lineup below. Tickets for Woodstock 50 go on sale on Earth Day, 4/22.